Sometimes a poem comes to me, and it is like meeting an old, dear friend unexpectedly. But sometimes a poem comes, and it is like walking into the kitchen in the morning to find that my pet collie has transformed into a savage wolf overnight. Just such a poem came from my innocent exploration into early English poetry. I was already familiar with the story of Beowulf. 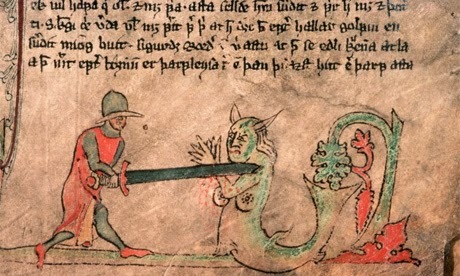 As a child, I had a book about heroes and mythology which contained some wonderfully gory pictures: Beowulf with Grendel’s severed arm, and even more intriguing, the monster’s mother, fiercer than her son, fighting with Beowulf in her underwater cave. It was only when I started to look into the original that I discovered that the word used to describe Grendel’s mother, anglaeca, is also used to refer to Beowulf himself. Some scholars believe that it should be translated as ‘fearsome’ or ‘warrior’ rather than ‘fiend’. In the Beowulf manuscript, she is referred to as an ‘ides’, a respectful way of saying ‘lady’. Elsewhere she is simply called merewif, a woman of the mere. Perhaps there was a territorial dispute about land use at the heart of this conflict between the mead hall and the mere. Whatever she is or was meant to be, her words came through very strongly as I wrote. This voiceless character had things she wanted to say. Principally she wished to offer Grendel some advice. He ignored it, which is every child’s prerogative. The alliterative style is typical of early English poetry. The marsh meets the sea, its master. of frogs and snakes is stopped with salt. and all meat moves on muffled feet. resolved to dig a drain and dry it. to hunt for me in Hrothgar’s hall. My incantations have thickened his hide. Rocks are no harder, oxen no stronger. Let them hew; he will meet no harm. with luck it will cover your smell. and the tall posts of the traitor’s hall. but don’t wake the dogs by the door. slake your thirst at a throbbing throat. the keen of his death through my teeth. in your mighty grip and meet me here below.